I just finished reading Rachel Singer Gordon's book: Point, Click and Save, and have to say, it would have been the most perfect book if only more of it would have had more Canadian links and sites I could use. I loved this book but found it more American orientated. 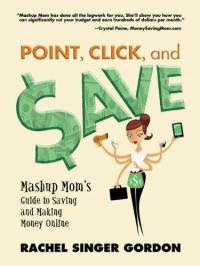 However, this is such a resourceful book on making and saving money and alot of tips are general for anyone. The book shows you how to shop so that your saving a ton of money,using online useful resources, and saving big time on your food bill. Plus there are many more useful chapters on making money at home,getting freebies,and so much more. You really have to get this book. You won't be disappointed. Rachel also has a great web site called Mashup Mom and invites all you money savers to drop over. I'm glad I stumbled upon this article. Sorry it does not cater to the Canadian market, lucky for me I live in the US. I might check it out. It IS a good book but the links are more US geared for most things.